We arrive at Santa Clara Guest House, and are checked in by a friendly Macaw. All around us are giant Hyacinth Macaws. This part of the Pantanal is one of the only regions in Brazil where you can see the this large Macaw species in the wild. It’s not just the Hyacinth Macaw around here. Hundreds of birds and dozens of species fly all around the farm grounds. Another macaw welcomes us at the check-in desk. Hawks patrol the garden. Parakeets fly by in pairs. A toucan in the distance. But it wasn’t the birds that really surprised me. For my two nights here, I joined a number of tours. First up is the boat tour, and our first chance to get really close to a caiman. One old croc swims right up to the boat. We see monkeys, and of course, plenty of the beautiful bird wildlife. The real fun started with the piranha fishing. Alex, our energetic guide, takes Udo, Gisela and myself to the river bank. Not from some boring dock, or even a boat, but on the side of this extremely slippery, muddy, sloping,river bank. We’re advised to take our shoes off, because “our feet have better grip”. And were not standing there barefoot for long before the Caiman show up on either side of us and try to eat our toes! We fight off the caiman, and attach our bait. It takes about three seconds for a bit from a hungry piranha. It takes longer to put the bait on the hook, that to get a bite. The water is too muddy to see into here, but I’m starting to get the sense of an extremely piranha infested river that I am slowly slipping into..
We’re not just piranha fishing, we’re sliding slowly into piranha infested waters, on the side of a slippery river bank, fighting off caiman, trying not to be eaten alive by mosquitoes. It’s all very surreal. I didn’t have my camera out, so piranha pictures and this crazy video, courtesy of Udo and Gisela, will help demonstrate the adventure of the day. 20 minutes later and we’ve got enough fish for dinner, and we’ve thrown plenty back in for being too small. It didn’t stop there though. Alex had one more surprise for us. And it wasn’t just more mosquitoes, although we did manage to find plenty of those on our nature work. More mosquitoes than I would ever like to see again. Alex’s surprise was Caiman Lake. I’ve named it myself, but you can see why. One small waterhole surrounded with hundreds of Caiman. I’ve never seen anything like it. Swarms of caiman – what is the collective term for Caiman? The wet season has started, but the floods haven’t arrived yet. This whole area should be underwater. It’s not yet, and all the caiman are forced together into smaller and smaller lakes until the water comes again. 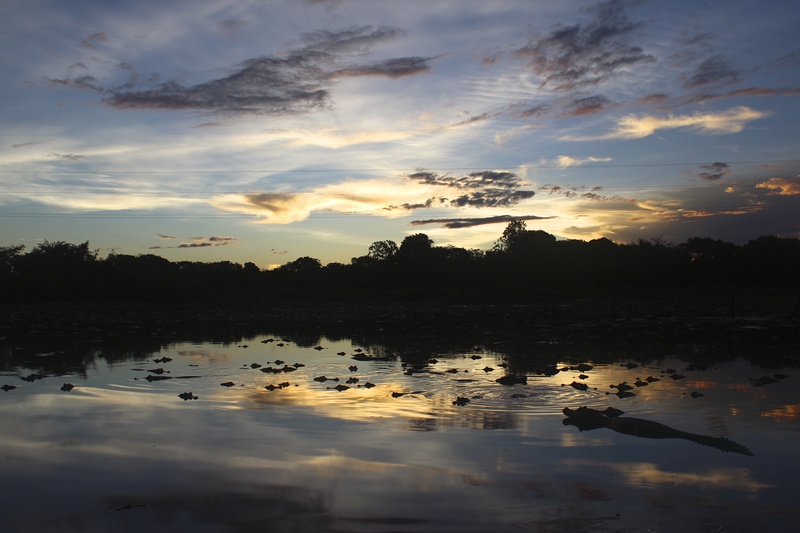 But for now, we spend a sunset with a thousand caiman. I thought this was a good place to make a video about me getting eaten. Back at home we eat our Piranha, and celebrate not really being eaten by anything ourselves, except mosquitoes. Thanks to Alisson, from Eco Adventures Brazil for organising this part of the adventure. This entry was posted in Brazil, Central Region, Eco Tourism and tagged Bird, birds, brazil, caiman, ecotourism, macaws, pantanal, piranha, travel, video. Bookmark the permalink.